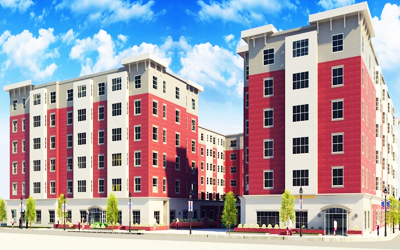 Description: The Exchange Street Apartment Project is among several new construction projects in the City of Malden. Within walking distance of public transit, the apartments will include state-of-the-art facilities with direct access to the City of Boston. Working with developer Combined Properties, Fenagh Engineering ensures that this ground-based 5-story wood framed apartment complex, with parking below wood-frame building is constructed according to plans and specs. This project is the first of many residential buildings Fenagh will be working on in coming years. Scope of Work: Services provided will include concrete (including post-tensioned decks), masonry, rebar, wood-frame, bolt testing, and misc metals inspection and testing.